The text of the ad read, "Dear New Jersey, When people call you 'The Armpit of America,' take it as a compliment. Sincerely, Dove." 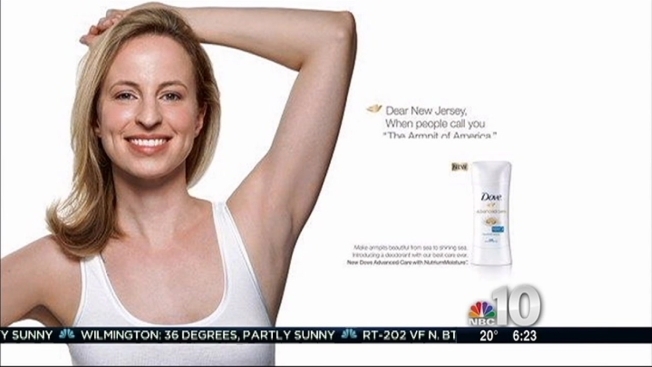 Dove is learning the hard way that New Jersey residents don't appreciate being referred to as "The Armpit of America." Unilever, the brand's parent company, says it no longer plans to run a billboard featuring the well-known dig at the Garden State. The ad was intended to promote a new line of deodorants by encouraging people to see armpits in a more positive light. The text of the ad read, "Dear New Jersey, When people call you 'The Armpit of America,' take it as a compliment. Sincerely, Dove." It featured a smiling woman in a white tank top raising an arm behind her head to expose an armpit. Dove is known for its unconventional ads, including a campaign that celebrates "Real Beauty" by featuring women who don't look like the typical models featured in most other ads. But the latest campaign apparently hit the wrong nerve with New Jersey residents. The news of the billboard, which was set to run in July, sparked complaints after the New York Times published a story about it last week. "We take feedback from our community very seriously and have decided that we will not be running this billboard advertisement," Unilever said in an emailed statement Tuesday. "We did not wish to cause any misunderstanding and apologize for any offense." The statement said the intention was to "call attention to the fact that armpits can and should be considered beautiful." It said women should accept that as "something that is okay." The company said it is working with its foundation to donate the billboard space to a charity. Unilever's U.S. headquarters are based in Englewood Cliffs, N.J.